WHEN DIRECTING, the golden rule is the most important person in the rehearsal room is the writer, even if he or she has been dead a few hundred years. 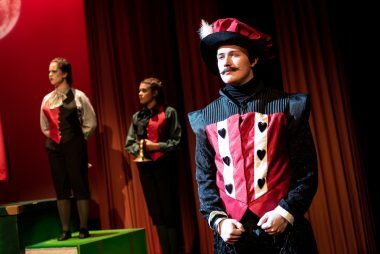 James David Knapp has a problem as not only is he directing ‘Alice in Wonderland’ in this Crescent Theatre production, but also he is working to his own adaptation. The vision we see on stage should be the vision he sees in his head. There is no higher authority to check if it works until it is offered up to an audience; therefore I shall try to be charitable. It is intelligently written but also oh so overwritten. The show opens with a damp squib when it should be a rocket. We are subjected to a long parental conversation about Alice’s schooling whilst all we want is to hurry up and get down the rabbit hole so we can have some fun. 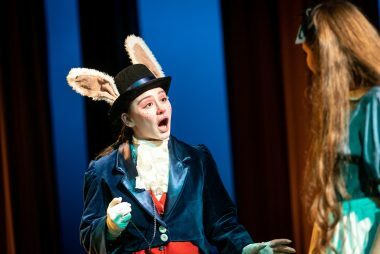 At last the parents retire for the night leaving Alice (a hard working honest performance by Ruth Waterson) free to get out of bed. The naughty girl has gone to bed with her clothes on but then again might she only be dreaming? Down the rabbit hole she goes to a room with a tiny door and a tiny table plus a bottle labelled ‘Drink Me’ and a cake labelled ‘Eat Me’. When she eats and drinks alternatively spotlights are turned on the audience, which I presume are intended to mask the transitions, but are actually both blinding and annoying. It would have been so much better just to make a spectacle of the crew doing the change with some music and imagination. The lighting for the whole of the first half is dim and moody, the costumes mostly dark and the dialogue for the most part, more insular than shared. This is more Underworld than Wonderland. 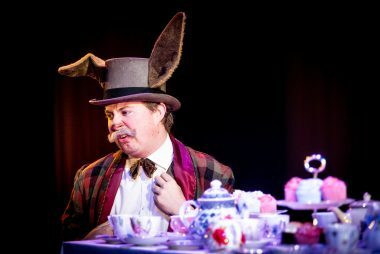 The Mad Hatters’ Tea Party should surely be a splendid piece of slapstick, not homage to Harold Pinter – we need something to make us laugh! The best bit of the first half is the scene coming up to the interval when at last the stage is flooded with colour and bright costumes as the Queen of Hearts is heralded. 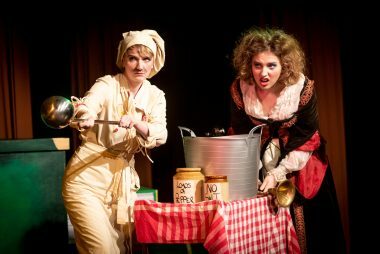 Act two is better – we get to meet some characters that actually raise a smile, namely the three gardeners delightfully played by Amelia Hall, William Stait and Ronnie Kelly. 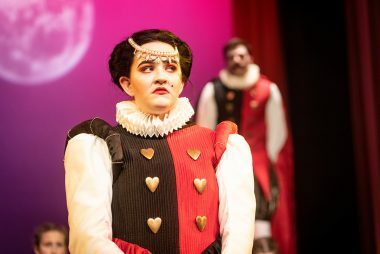 Alice Macklin also applies herself with royal gusto as the Queen of Hearts. For me the croquet scene with the pink flamingos is the high spot. If only there were a couple of songs, some dances and a few maroons going off to add some magic. The company will no doubt gain luster and up their game over the run but currently this seasonal offering is a lost opportunity to show the Crescent at its best. Roll on the Wassail! The show runs until next Saturday, December 15. Tickets are £17 adults (£16 concessions) and £15 for children.